The recent interest rate rise will affect small businesses in the way that they loan money to fund growth. Normally, an increase in interest rates means that consumers will borrow less and save more of their money than spend it. This may mean less sales and hence a move from businesses to lower prices. For small businesses, less profits and growth could lead to disaster. 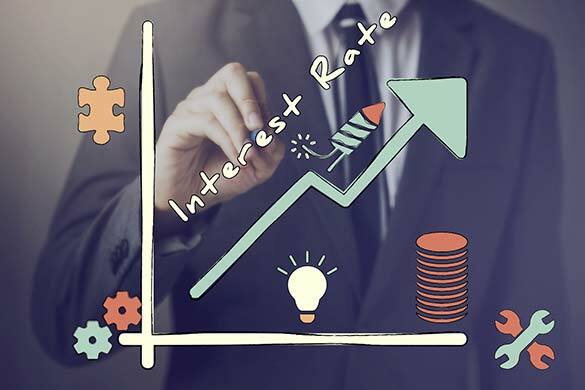 This guide will explore the options open to small businesses as they plan for the knock-on effects of an interest rate rise. Small Businesses should plan their finances in advance of the interest rate rise. If your small business has not done this already, then it needs to be put into place as soon as possible. This will highlight how much your small business relies on loans and funds and how much more interest you will now pay. By planning your finances, you will be able to ascertain how much you will need to cover costs and continue to grow. Other means of financing your business may be able to use, may be highlighted through your financial planning and forecasting. This will also lead you to decide whether you should stop loaning money for the moment until you have understood the impacts of the interest rate rise on your business. Planning your cash flow and forecasting cash flow in advance, will help your small business cope with any interest rate rise. This is due to the increase in the amount of interest you will have to pay for loans and hence decreasing positive cash flow. It is important to keep your expenses to a minimum to ensure that your cash flow can sustain your small business. Small businesses may need to use any savings that they have accumulated to fund growth instead of taking out loans. This is the best option to ensure that your small business can grow without increasing expenses. The advantage of a fixed rate loan is a good way to secure funding for your small business without paying greater amounts due to increased interest rates. The best fixed rate loans should be secured as soon as possible if you need funding to keep your business running.